I am hearing that our weather will start to cool down soon. With that being said its only our hardest anglers that are showing up with fish. We have some news from up on Lake Mohave the catfish bite is best near the coves by the Davis dam, with some channel cats in the coves near the power lines. The striper bite is still a hit and miss with some action near the Arizona side near the dam. 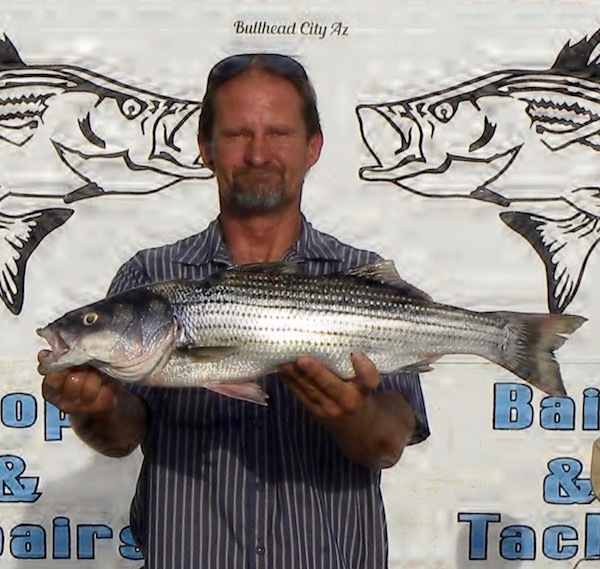 Our local angler Kris Moore landed a couple of channel cats one at 7.22 pounds and 24 and 5/8 inches and the other at 4.24 pounds and 21 and 7/8 inches the larger striper was 3.52 pounds and 21 inches. A good tip on the lake is to watch for the boils if you see birds in a area try fishing there. There has been some small mouth activity mostly at the entrance to the coves.